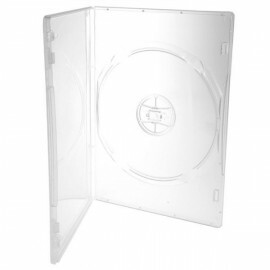 These black Double DVD cases w/flip tray and without DVD logo are brand new and high quality. It is identical in size to a single DVD case so the standard DVD case insert will fit right into the plastic overlay. This is the high value case used by major media duplication and replication companies. It has a plastic overlay 10 3/4" (length) x 7 3/16" (width) for a DVD cover. Min Order: 100 pieces, increments of 100.